FunKhel™ presents Letters, Matras and half-Letters with delightful clarity, enabling Users to easily make simple or complex words. “language assist” helps by translating all instructions and rules to English. Make words, check spellings, score points and bonuses! 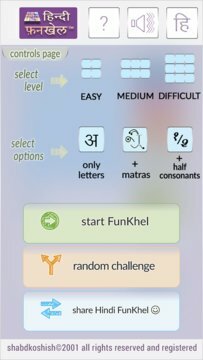 Challenge and improve your Hindi vocabulary “fun” - whether you are a beginner or an expert... just by playing FunKhel. Once installed, you can play FunKhel™ offline - you won’t need the internet! Word meanings are Coming Soon!